Hiace Hobo - Living in a Toyota Camper Van: Thoughts on the New Year..
2014 is here.. I've had several conversations over the holidays about how the turn of the year is a time when people start over, really think deeply about their lives, and sometimes make huge personal decisions and actions that will change their future.. In the philosophy of van life, making the decision to live on the road, takes us beyond this once a year 'taking stock' and releases us into a new world where this is almost a perpetual state of being. Life can be reinvented month to month, week to week, and on a trip, day by day.. It's from this perspective that I'll share with you some recent events in my own life that though challenging, lead me into the new year with anticipation, optimism and a new appreciation of my chosen lifestyle.. In seconds I'd lost my home, transport, and was facing an uncertain future. Bare minimum, now meant what I could fit in the boot of a three day hire car. Would my truck even be repairable? Thankfully, no one was badly injured, but seeing the other car almost flattened by the Hiace, this was hard to believe. After many hours on a dark roadside trying to arrange international recovery with a poor signal, I was taken to a nearby town, where I had a restless night in the back of my wounded van - nothing to do but let the morning arrive in its own time. 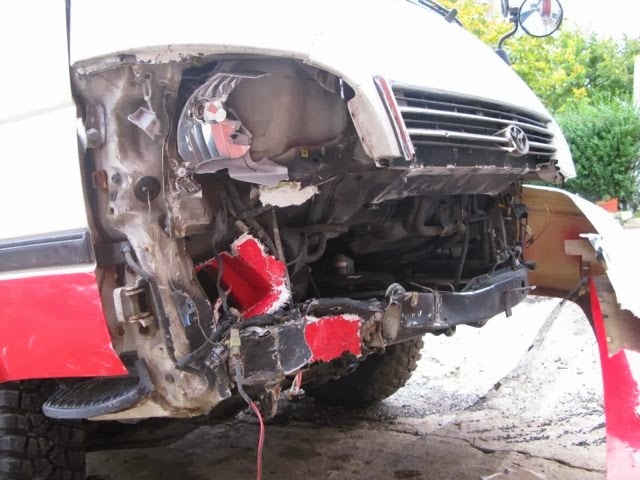 After two days camping in a recovery yard I had arranged a plan through my insurance company. It was agreed that I could submit a repair quote to them when one could be drawn up by the local garage; under the circumstances a vehicle inspection would not be necessary. Through his English speaking son the mechanic was able to tell me that my van was repairable - listen up! This model of Hiace has nothing mechanical at the front end. Engine, transmission, and even the cooling system are well tucked away underneath. In fact the engine still started when the key was turned. I was also unscathed. Safe vehicle! I set off in a hire car for my place of work. They'd agreed to make room for me in the villa until my van would be back on the road. As I drove south, the back filled with my belongings I wondered how long it'd be until I was free and independent again - still with a doubt in my mind that the repairs would be too expensive and I'd lose the van. As it turned out it was a number of weeks until I had a repair quote and had it authorised by the insurance company. I gave the signal and the repairs could begin - money arrived in my account a few days later. Since then it's been just a matter of time until I can start again. 2014 begins for me with a heightened sense of beginning anew, I've been without my van long enough that its return will be almost like beginning again in a new vehicle after planning and looking forward to it - rethinking every detail. I'm thankful for having had this opportunity to reassess my choices, and it's certainly a life I'll choose a second time. My van will also look different on its return. Under the circumstances the Supercustom front end would have been too expensive to source from Japan, so it'll have more standard Euro lights and grille. It's getting a Portuguese facelift, taking on the character of its surroundings. I'm not concerned - as long as its running - back on the road. I've also got a few ideas on how I'll make it unique. So as I arrive back in Portugal after flying home for a Christmas break in Ireland, again a new and exciting future lies ahead of me. I'll have my van back soon (hopefully within the next couple of weeks), and as I wrote about previously - plans are already being made for another trip in March. I'll also be able to get back to sharing some more camper van life stories and recording some new videos too - I already know some great places I can hardly wait to visit. Sorry about your accident. Must have been traumatic awaiting go ahead for repairs. Glad you'll soon have your lovely van back soon. Looking forward to your posts when you're back on the road. Wishing you a Peaceful & Prosperous 2014. Yeh, its been a bit of a strange time. The location is wonderful, and everything I anticipated for the winter, but of course without my van its just not the same. It is a great lesson in how to adapt when things don't go according to plan. Not only that, but how to adapt when you are off course for a period of time, knowing that you'll be back on course at a point in the future - how do you deal with this. Its not dealing with only a change as such, but a big gap. Living in Limbo Land. Anyway - I hope you're enjoying the winter months there and looking forward to some good trips in the spring and summer. I'll likely be back in Scotland at some point this year too. The only thing I'm 100% certain of in life is that everything changes constantly! I think you embrace that concept but, like you, I find Limbo Land circumstances extremely difficult to deal with. In your accident and circumstances you temporarily lost your home and freedom which are big things in life for anyone to deal with. Soon you'll have your home and van back which is great news. If you're anything like me you'll have spent some very difficult moments after your accident wondering how things are going to pan out! But I agree such incidents make us thing about things in a lot of depth. So far, I always come round to thinking that coming through stuff like that helps me to learn and makes me stronger in dealing with life. I love my van. Really getting used to driving it and love going out in it. Not been too far yet but busy thinking about early spring and basics I'll need. Like you I am planning to not need electric hook up. On a practical note I have a question. Garage has advised me 6000 miles or 6 months before service. Got a 3 month warranty for van from garage I bought from and they have looked after it for past 5 years. Nothing major in history, cam belt change , tyres, oil filter change etc. Van is going great with no problems at all (fingers crossed) and have done approx 1500 miles so far. How often do you change your oil and filters? Do you think I'll need a service in 3 months time when I've done approx 3000 miles but bearing in mind I'm getting ready to go roving up Scotland. I'm thinking an oil and filter change will suffice at end of March? Would value your opinion. As ever, thanks for your wise words and reflections. I am still in the same situation here, but I know that things will come together soon, and there is plenty to do here so all is well! Thanks for your opinion. I appreciate it. I'll book van in about March for oil and filter change and general check. I'm also going to arrange breakdown insurance but from what I've read if you maintain a Toyota Hiace it's a rare occurance that it breaks down which is reassuring! I hope you have your van back soon and am glad all is well with you. Love your blog it's so interesting. Thank you for taking the time to post about your life on the road. Just what you did not need over the Xmas period, glad you were ok though. Look forward to the next chronicle when you get back on the road. You're right there Phil, and thanks.. I can't wait!